Oh boy. You’ve noticed that your cat’s claws are sticking to the carpet when they’re walking. And the last time you were playing with them, they swatted at you and it cut you way deeper than just a slight surface scratch. It’s time to trim your cat’s claws. Usually, you might give your local groomer a call and make an appointment to bring your cat in – but what if you could avoid that whole ordeal and just do it yourself with a pair of cat nail clippers? You might be laughing and saying, “Absolutely not.” But it’s actually not as scary and difficult as it seems. True, your cat isn’t going to be happy about having its nails clipped (that’s almost always guaranteed). However, if you approach the task in the right way, it isn’t as hard as you think. They wouldn’t make cat nail clippers to sell at pet stores if it was such an impossible task, right? If you’ve never touched a pair of cat nail clippers in your life, or have tried to clip your cat’s nails in the past without success, we are here to help you out. There are a number of little tips and tricks to make it easier to clip your cat’s claws, and proper techniques to make sure you’re causing your cat the least amount of discomfort. Now your cat will probably be pretty irritated when you go to clip their claws. But, if done properly, it shouldn’t actually cause your pet any pain at all. However, if you cut your cat’s quick, they will be in a lot of pain. The “quick” is the area inside the claw where your cat’s nerves and blood vessels are. It usually looks like a little pink triangle inside your cat’s nail, and it’s usually pretty obvious to tell where it ends. If cut, the quick will bleed quite a bit and cause your cat a lot of pain – so it’s best to avoid cutting too close to this highly sensitive area. It’s better to clip less of your cat’s nail than to risk injury to the quick. Here is a great page with a diagram of a cat’s nail and the quick. You should first make sure that your cat is in a position that is not only comfortable for them, but also so it’s easy for you to hold them while you clip their nails. Usually, the easiest way is to have your cat sit on its rear in your lap with its back facing you. Then, hold your cat’s paw in one hand and the clippers in the other. But if this doesn’t feel comfortable for you and your cat, try out a few different ways of holding to make the nail clipping as easy as possible. As you probably are aware, cat’s claws are retractable. So in order to clip them, you need them out. By gently applying pressure on your cat’s paw, you’ll ease their claws out so you not only can actually clip the nail, but also have full view of the quick to avoid accidentally cutting it. Now that your cat’s claw is fully extended, you’ll need to decide where you want to do the clipping. As we’ve said about a hundred times by now, you really do not want to cut the quick. Ultimately the goal in trimming your cat’s nails is to remove that extra sharp point or anywhere your cat’s nail is splitting. So, if you only feel comfortable cutting off the very tip – that is just fine! Once you get more comfortable clipping your cat’s claws you’ll be able to trim off more. Next, it’s important to get a nice, clean cut on your cat’s nail. In order to avoid any additional splitting of the nail, you will need to orient your clippers vertically, and so that the clipper cuts from bottom to top – not top to bottom. Basically, you’ll want the top blade to rest on your cat’s claw as you pull up on the bottom blade to make the clip. This motion will also depend on the type of cat clippers you are using. We’ve covered the basic techniques and steps you need when cutting your cat’s claws at home with clippers. You could sit down right now with you’re a pair of clippers in one hand and your cat in the other, and get the job done. However, there are a few little tricks to make the whole process way easier on you. It’s better to work smarter, not harder – right? This sounds more devious or deceptive than it actually is. Basically, you just want to clip your cat’s nails when it is super relaxed and calm. It honestly isn’t even a bad idea to sneak up when he or she is sleeping. Clipping your cat’s nails is going to cause enough irritability and anxiety as it is, so you might as well start the process at a point of the utmost tranquility. Definitely do not attempt to clip your cat’s nails after he or she has gotten wound up chasing a toy mouse around, or something. The lazier your cat is, the better when it comes to clipping nails. Oh – and we definitely recommend choosing a quiet place for the claw clipping! Ok, we promise we aren’t trying to make these tips sound so criminal or morally ambiguous. But you should give your cat a whole lot of treats while you’ve got the clippers out. For one, your cat will definitely deserve a treat after putting up with you clipping its nails. But over the course of time, your cat will begin to associate the nail clipping process with treats. Hopefully, this will make your cat less resistant in the future when it’s time to clip those claws. One of the toughest parts about clipping cats’ claws is that they don’t particularly like having their paws held. However, many people have found that if you spend some time massaging and holding your cat’s paw for a few minutes, they get more comfortable with it. Then, they won’t feel extra uncomfortable when you hold their paw to actually clip their claws. Be nice and gentle, and pay attention to your kitty’s body language. Besides, your kitty deserves a little foot massage every now and again! Don’t worry – no one will be eating this cat burrito. A good way to get a cat to calm down and feel secure is to wrap it in a soft blanket or towel, like a burrito. This will not only make your cat feel cozy, but it will also help keep him from squirming around too much or scratching your with his back claws. It’s just a great, yet simple trick to help you hold your cat when you are clipping. We know you will be tempted to try to get all four paws over with, but we do not recommend clipping all of your cat’s nails in one go. Your cat will be much happier if you only do one or two paws at a time. There’s no rush, so let your cat recover a bit after you’ve clipped a few nails. Give your kitty some treats and lots of love to help them chill out a bit. Let your cat decide when to take the breaks – you’ll be able to tell if it’s time to let your kitty free for a bit. PROFESSIONAL STAINLESS STEEL CAT NAIL CLIPPERS - The thick and sharp stainless steel blades is strong and sharp to last for years. NOT JUST FOR CATS - These cat claw clippers are designed for medium and small dogs, kitten, cats, rabbits, puppy, birds guinea pig and small pet. 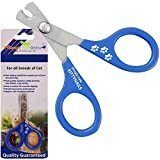 DESIGNED FOR SAFETY FIRST AND EASY TO USE DESIGN - With reliable grip rubber coated handles ensures a comfortable cat nail trim, no slipping (remove grip) when using these pet nail clippers or nail trimmer for cats ensuring a safe nail trimming experience. HIGH QUALITY - These cat nail clippers are quality controlled during the process of manufacturing making this one of the best or top quality professional cat nail clippers and pet nail trimmer on the market. LIFETIME GUARANTEE - The manufacturer's warranty and guarantee for this product is only valid if the product is purchased through an authorized seller. Don’t let the prospect of clipping your cat’s nails scare you because you now have a whole bunch of tips and tricks in your arsenal. Clipping your cat’s nails can be a very easy process for everyone involved as long as you follow the steps we’ve listed above, and taken some of those hacks into consideration. But perhaps the most important tool you will need is patience. You don’t want to rush any aspect of clipping your cat’s nails. If you take your time, you won’t make your cat overly anxious, accidentally cut the quick in their claw, or get scratched yourself. Be firm, but gentle, and pay very close attention to your cat’s body language! It might take a few times before you really get the hang of it, but after a while using cat nail clippers is a total breeze. Plus, you will no longer have to pay extra money to have a groomer do the clipping!